Extreme drug abuse, addiction to pain, is prevalent around the world. Worth billions in illegal trade, the major drugs – methamphetamines (meth), cocaine and heroin – have been wreaking havoc individually and collectively for years. Another narcotic, fentanyl, about 100 time more toxic than morphine, is being mixed with cocaine and heroin, imported, and sold illegally with tragic consequences. “Fentanyl has been mixed with other drugs such as heroin and cocaine. “It has been used in tablets made to look like prescription drugs. “Overdoses have occurred where individuals were not aware they were consuming fentanyl. “It is odourless and tasteless, and therefore hard to detect. “It is often found in powder, pill, liquid and blotter form. “2 milligrams of pure fentanyl (the size of about 4 grains of salt) is enough to kill the average adult. “Unintentional exposure to pure fentanyl – touching or inhaling – can cause serious harm including death. 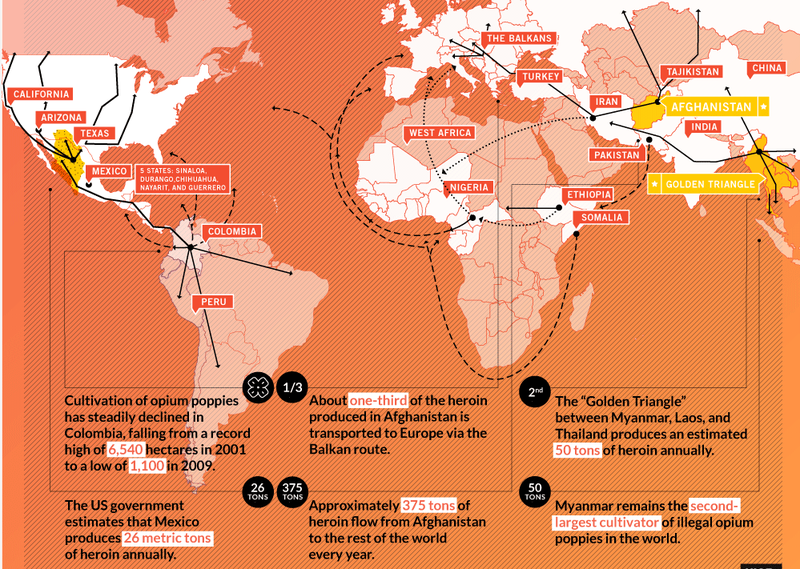 Below is information about the drug trade around the world. Some of the statistics are from a few years ago. “Methamphetamine. . . has become one of the most popular — and profitable — illicit substances in nearly every corner of the world. 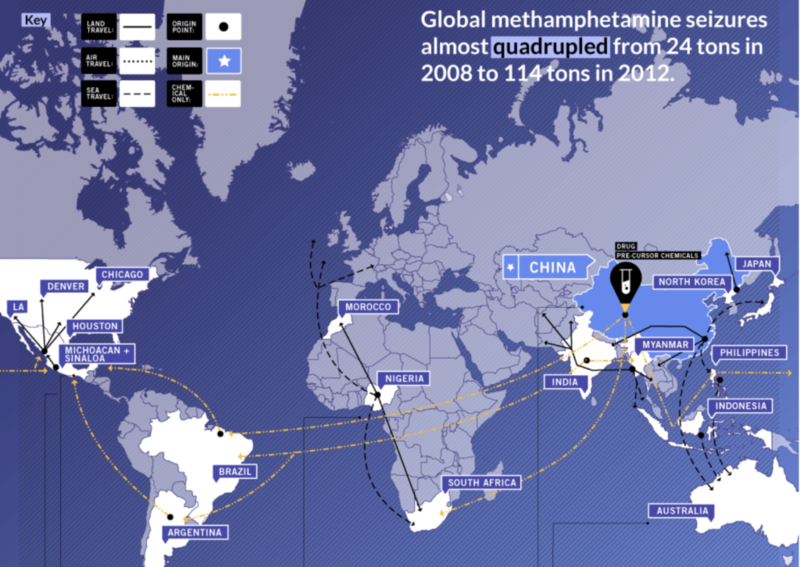 From Australia and Asia to Africa and North America, meth is the poster drug for the global narco economy. “Opium poppies can be found in nearly every region of the world, but they were introduced to Mexico in the late 1800s by Chinese immigrants. The plant it is now grown primarily by impoverished campesinos in mountainous parts of the states of Guerrero and Nayarit, and in the so-called Golden Triangle, a lawless region on the frontiers of Sinaloa, Durango, and Chihuahua. 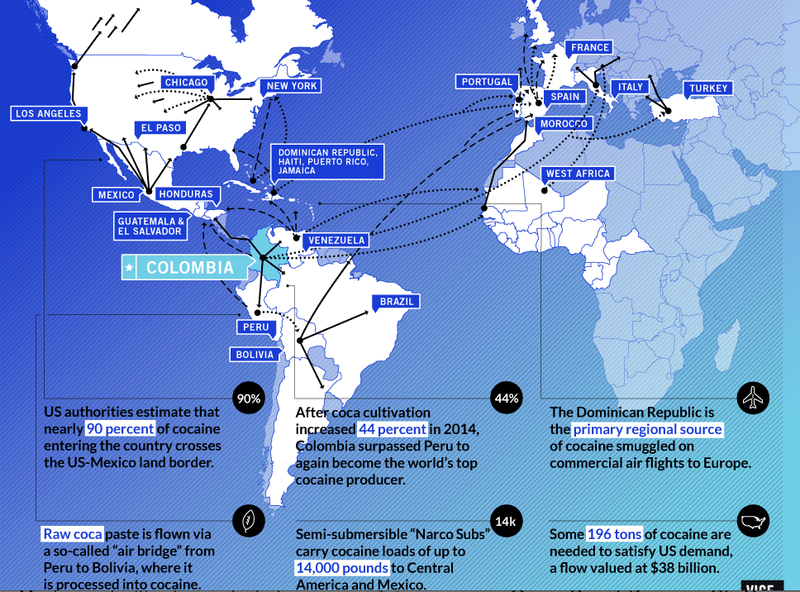 The Sinaloa Cartel controls most of the heroin production, and the organization has started to move from producing lower-quality ‘black tar’ heroin to higher-grade ‘China white’, which is more lucrative and prized by consumers in the northeastern US. “For years, Colombia was the leading supplier of ‘China white’ in the US, but poppy production has steadily declined in the country over the last half-decade. Bargent, the Colombia-based organized crime expert, said Mexicans have stepped up to meet the American demand. Often fentanyl addiction can start with a prescription for painkillers, such as Oxycontin. At the bottom of this post is a video describing the tragic death of a young person who was prescribed Oxycontin after a bad fall. As it was stated above, fentanyl is also cut into heroin and cocaine by the traffickers and dealers. “The problem began in the late 1990s as hard times came to large swaths of Russia and its former satellites after the fall of communism. Although Estonia as a whole was charting a promising course, some areas of the country – such as the northeast – were hit hard by the collapse of its industrial base. “It was an environment ripe for drug dealers to exploit. By 1999, between 15,000 and 20,000 people in the country of 1.3 million were hardened heroin addicts, fed by a reliable supply from the poppy fields of Afghanistan. Most were male, and most were under 25. “The following year, when the Taliban imposed a ban on opium, the supply to the former Soviet republics was cut off. To fill the void, dealers began production and street distribution of synthetic opioids. ‘China White’ and ‘White Persian’ – street names for fentanyl and its molecularly similar cousin 3-methylfentanyl – were pushed to users who could no longer get heroin. “Almost immediately, there was an epidemic of overdose fatalities. “One recent development has seen more Afghan heroin — an estimated 35 metric tons per year — shipped across the Indian Ocean to parts of East and Southern Africa. The UNODC said it’s also becoming more common for heroin smugglers to use their networks to smuggle hashish, methamphetamine, and other illicit goods.